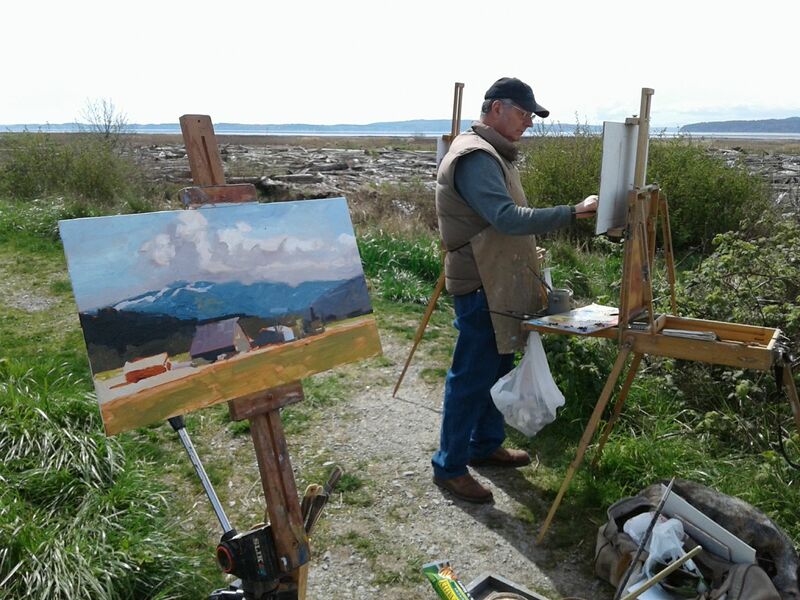 We set up on the side of the road by the tulip fields in Laconnor to paint the amazing colors of spring in Skagit Co. I knew which view I wanted to paint and quickly set up my easel after parking in a questionable turnout along the road. It gets pretty crazy during tulip season with many more visitors than usual clogging the two lane roads , pulling off anywhere , taking pictures and filling all available parking. It was not very long before an officer on a motorcycle , no doubt getting overtime pay, pulled over and told us we could not park where we were and suggested another location across the road. 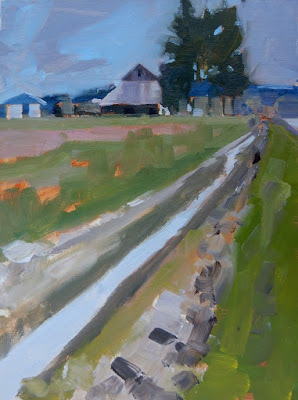 I left my pochade box by the road, moved the van and then jogged back to continue painting. When I finally took a breath and looked around there were a lot of views to paint from right were I was!.....I turned about and laid in this composition in about twenty minuets . I'll post the painting I started with next time! Have fun out there and watch where you park! As you are heading into LaConnor from Fir Valley Rd. there is a place to pull off and park. I never tire of the views from all directions in this little spot where their is plenty of room for a couple cars to park and paint. I didn't have a lot of time so I pulled out a 6x8 panel and scraped up all the juicy paint on my palette for this little study of a distant farm. 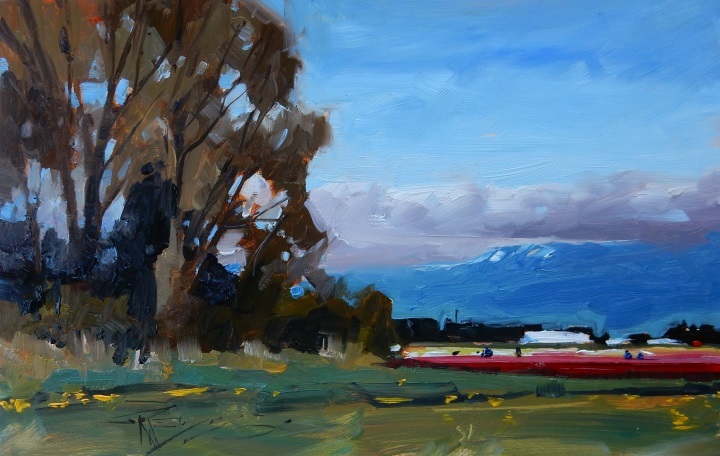 Using a fairly big brush and lots of paint I laid this composition out quickly and let it stand on it's own. Thanks for stopping by IPA! Have fun out there! 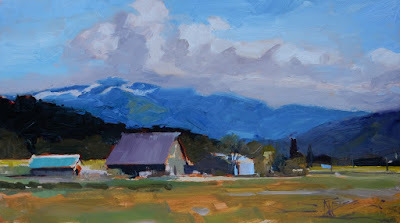 At least once a year I try and visit my friend Mark Bistranin in Skagit County to paint for a few days. He co-owns and operates the Seaside Gallery in LaConnor. The Skagit valley once inhabited by the Salish Indians was a valley of small prairies that were burned in controlled fires to harvest bracken ferns and camas . After the development of the dike system the unmanageable wetland area became a fertile area for agriculture. 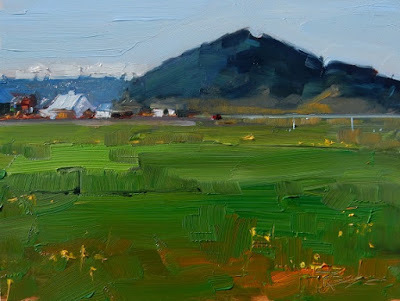 These days it is still a vibrant farming community and a great place for us painters to find stunning views of fields and farms surrounded by mountains whose mood and atmosphere are constantly changing. "The life I love is making paintings with my friends"
This is an area on Fir Island that Mark and I go to paint a lot. It is a wetland, salt marsh at the end of......well, I can't remember the name right now...it will come to me...But, it is the first road to the left as you pass Snow Goose Produce. Follow it past farms to the very end and there you are. It can be tricky to turn your car around down there but I have turned my van many times....just be careful you don't back into a irrigation ditch!! I entered this painting in the "Little Gems", small works Show at the Scott Milo Gallery in Anacortes and it garnered a Best of Show Award!! How cool is that! 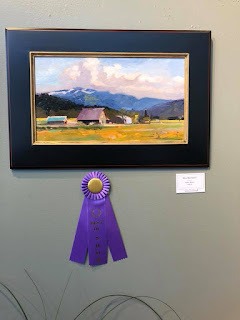 Thanks much to the good folks at Scott Milo Gallery and Judge of awards, Michele Usibeli! You still have time to go see the show! The closing reception is this Saturday the 30th at 3pm. 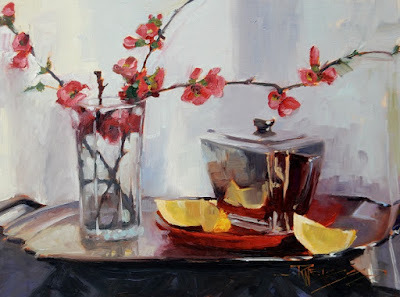 I got a lot of mileage out of the Quince blossoms I plucked from the side of the road...and those lemon wedges! You can see in this painting how they are starting to dry up and the rind is turning a dark burnt orange. This is the last painting I will be posting in this series as I keep trying to catch up to real time and what I am working on now. 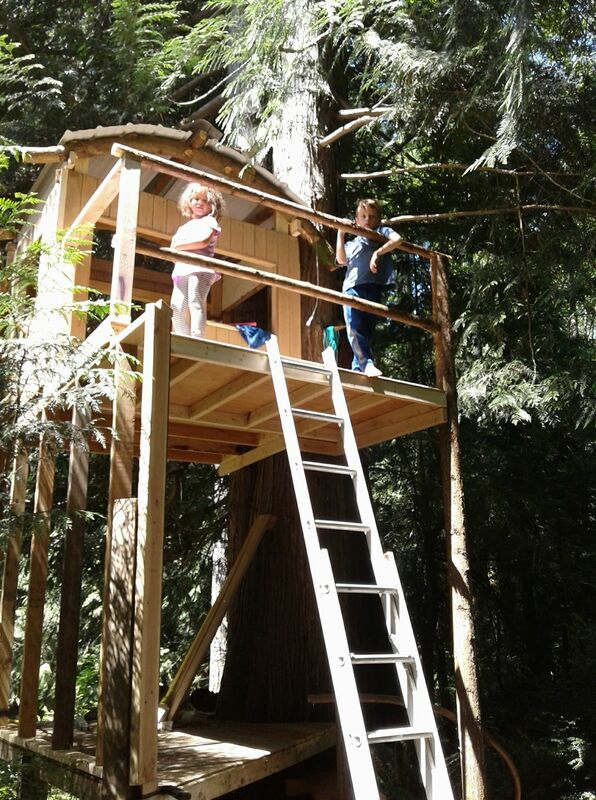 Maybe I can do it in the next few weeks because my painting time has been taken up working on a treehouse for the grand kids....Ha! I used a different fabric scrap for this painting. 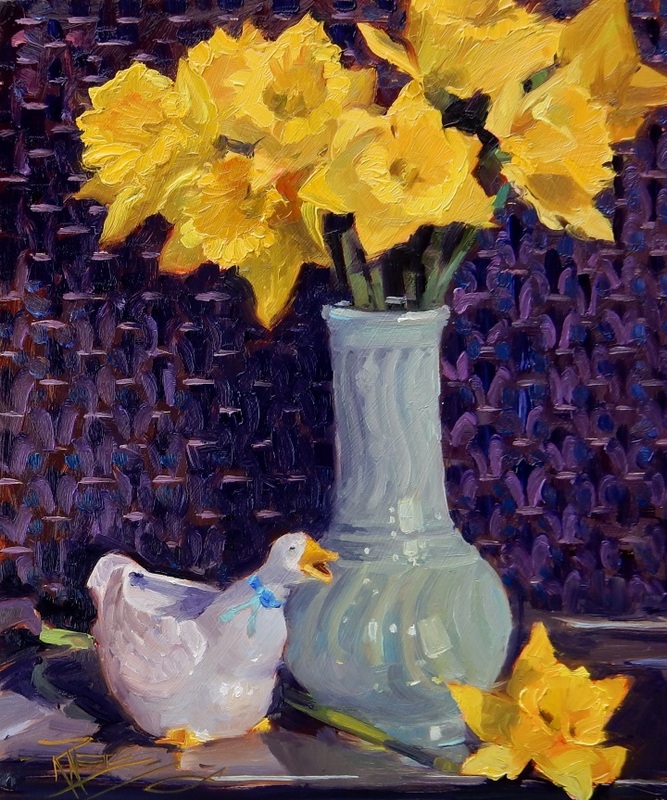 The idea was to compliment the yellow of the daffodils with the purple background of the fabric, again creating a dramatic contrast. My studio mate, Leigh , lent me a big pile of fabric scraps to use as still life props. 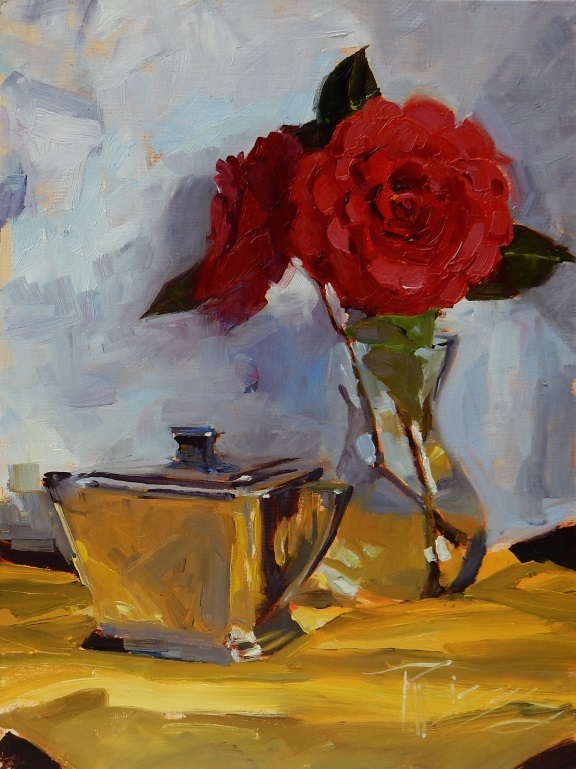 I set this color composition up in the studio under natural light . The idea was to get a dramatic contrast between the red backdrop and the stark white vase. Think I should have worked on it a little longer and resolved a few things like the leaves and stem of the camellia blossom. I have a problem with overworking paintings so sometimes fall short of actually finishing them to the best advantage....It's tricky! I used the Quince blossoms again and put them in a blue vase used in many paintings over the years. I focused mostly on the lemon wedges and getting the transparency and glow of light coming through the pulp. 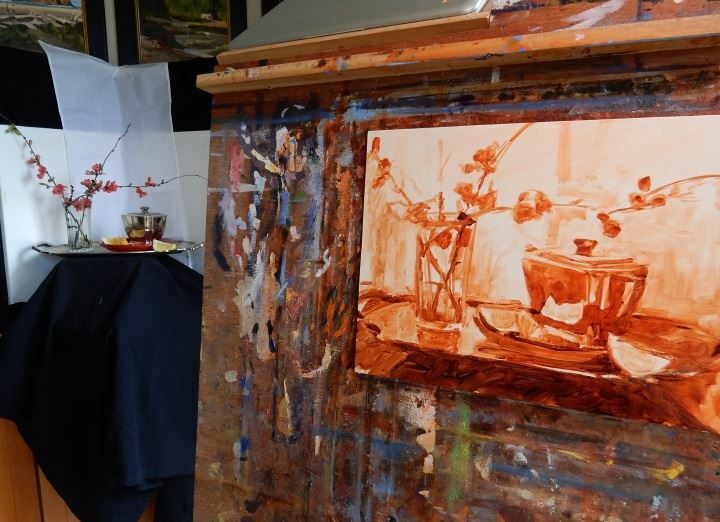 Also I like using a reflective base and the silver tray that came with the art deco tea set works really well. 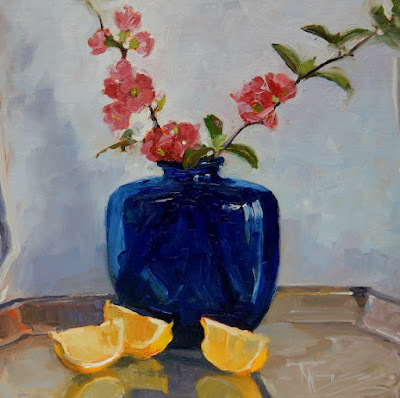 I think that a better composition could have been achieved if I had used more blossoms and took a little more time arranging them as I did in an earlier post of "Quince with Lemons" ....Those lemon wedges lasted through four paintings!! I just really enjoy painting the reflections in silverware. 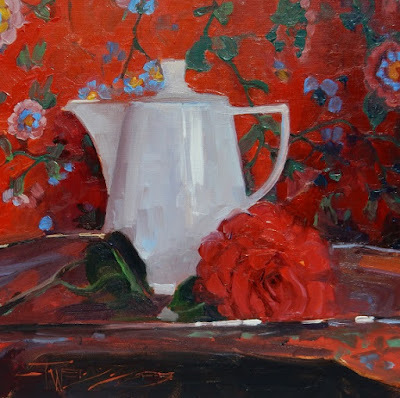 I used the art deco sugar bowl again in this composition....The juicy red camillias were provided by a nice neighbor who was trimming her bushes away from the road just as I drove by....Score!! I entered this one in the American Impressionists National Show...Hope I get in this time!! 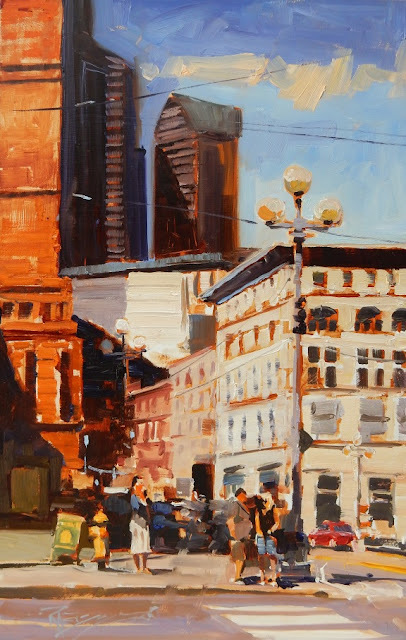 This was a fun demo painting I did from a photograph taken while I was having coffee at the Zeitgeist Coffee shop in Seattle. M Graham Paint co. has been sponsoring me and sometimes will send me off to do a demo or promotion at one of their vendors. This time it was in Port Townsend at Quimper Mercantile, a cool store with all kinds of stuff including art supplies!